In advertising, the general train of thought is a brand or business must be big and bold in its messaging, with cutting-edge and attention-grabbing graphics and taglines. This is true in many cases, and it works. This can also be overwhelming – particularly for small businesses that may not have the resources, budget, or simply prefer a more low-key approach. Their wishes may soon be answered by Instagram. Along with Yelp and Google Maps, local businesses can expect another site where they can showcase their goods and services. Social media favorite Instagram is in the experimental stages of developing such an app. 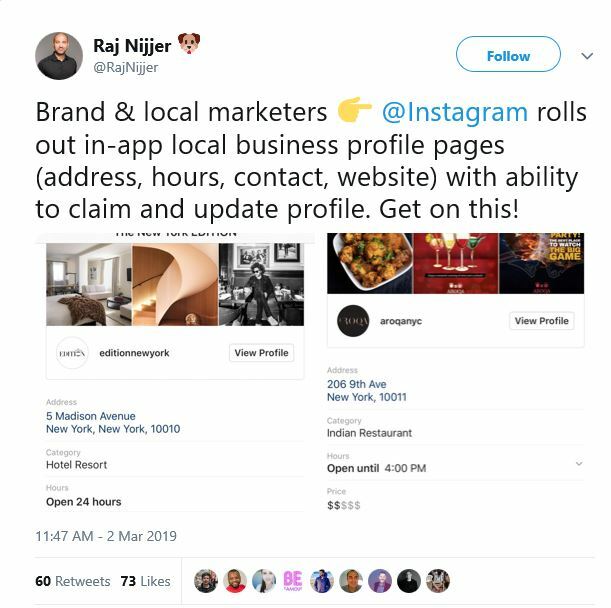 Matt Southern, writing for Search Engine Journal, gave a general description of the in-app local business profile pages of Instagram, noting that their general look resembled the “knowledge panels” found on Google. Business owners featured on this app can easily claim their pages and update information as necessary. A work in progress for Instagram. It should be reiterated, however, that this Instagram app is still being tested, and so pages may not be readily available or visible to the general public. The app was informally showcased on Twitter (ironic, yes?) by Raj Nijjer, VP of Marketing for Yotpo, who posted an image of two Manhattan businesses: The New York EDITION Hotel and a restaurant named aROQa. Because it is in experimental mode, Mr. Southern notes it has been accessible apparently only by some social media users. What’s this Instagram app all about? Instagram users wising to learn about (or even contact) a business can do so without having to leave the platform. Business-to-business companies can research co-working spaces and more easily find the place that suits their needs. As Instagram has been working toward the goal of closing the “buying cycle” for companies, this app will facilitate this process. The Instagram “shopping feature” for eCommerce platforms may open up to local businesses, once this new app is fully available and accessible. Ms. Hearn concludes that this new local business-friendly app is an example of Instagram’s growth from being simply a “photo platform” to one that can genuinely benefit and serve its users. Additionally, the points listed above have a common foundation that appeals to all: an integrated, seamless experience. And, with the previously mentioned “just the facts” tone and approach of this new app, there is greater transparency between local businesses and customers. Would you like to know more about how EGC can help make your business or brand increase visibility and reach through our social media services? Contact us today.